With home prices still rising rapidly, inventory has remained tight as many potential Queens home sellers hold out in an effort to wait until prices peak. However, with builders ramping up operations and the potential for interest rates to rise, it is still a good time for prudent homeowners to take advantage of the tight market. A brief jump in interest rates in mid-June slightly tempered home sales but are expected to stabilize and demand will respond positively. Demand is still very high for entry-level homes as first-time buyers compete with investors for the best properties in Queens County. 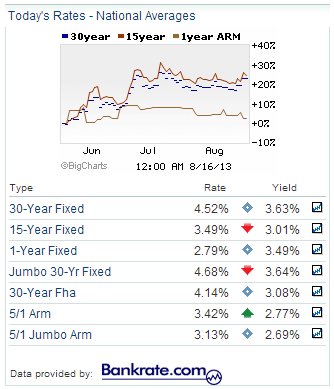 Interest rates for 30-year fixed-rate mortgages are currently 4.37% with 15-year rates at 3.41% and 5-year adjustable rates at 3.17%. Queens experienced another month-to-month gain in total existing-home sales for the month of July amounting to a 9% increase from the previous month. The seasonally adjusted annual rate rose to 803 for July, up from 737 in June. This is 17.1% higher than transactions in June 2012. We still believe there is a strong outlook in the Queens housing market despite the rise in interest rates. 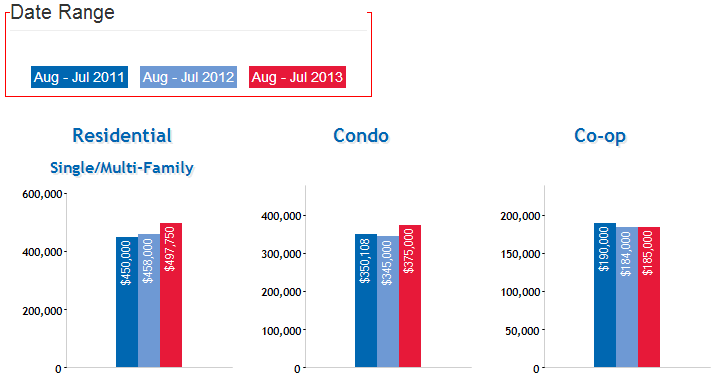 This is evident by the four consecutive months of year over year double digit home sale increases. 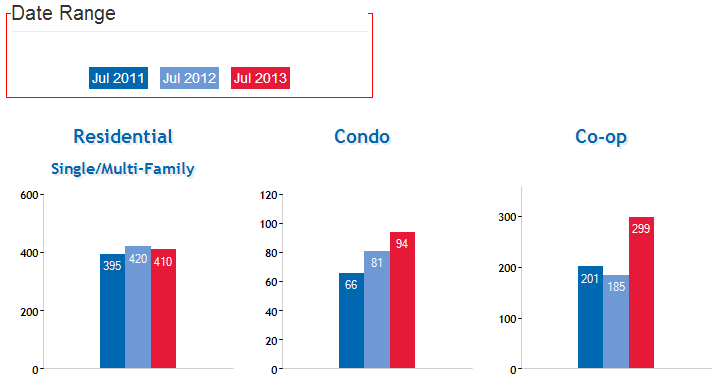 Residential One, Two, and Three Family home sales are down 2.4%, Condo home sales are up 16%, and Coop Sales are up 61.6% from July 2012. The median existing-home price for Queens reached $365,000 in July, which was 5.1% higher than the previous year. On a month-by-month basis, July’s median price is .8% lower than the price of $368,000 in June. This is the ninth consecutive month of year-over-year price increases. Residential One, Two, and Three Family home prices are down 8.7%, Condo home prices are up 8.7%, and Coop prices are up .5% from July 2012. Inventory in July represented 9 months supply, down slightly from 9.3 months in June. Total housing inventory rose by .3% in July from 6,123 homes to an end total of 6,144 homes available for sale. Dealing with low inventory can be a struggle for buyers but with prices recovering it is still possible to find good deals on Queens NY homes. Courtesy of George & Abigail Herrera with the Queens Home Team @ Keller Williams Realty Landmark.